I have a confession to make. 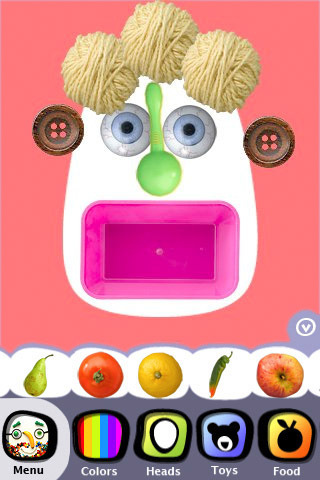 While I was checking out the Faces iMake App for iPhone and iPad, supposedly designed for kids, I got absolutely hooked. The create-a-collage premise of the app is simple enough for a four year-old, and even a forty(something), to jump into quickly and is completely engaging. There are a bunch of different templates to get you started. Just choose a face shape, a background color, and start inventing hilarious portraits using a wide selection of everyday objects like food, toys, candy and items you find around your house. You can enlarge and rotate your objects to build a face only a mother could love. Then, you can email it, tweet it, Facebook it–you get the idea. Download the Faces iMake App for iPhone and iPad at the iTunes App Store.